2nd place was a strong Finish Remmi-Team/TTKK. The recode was 1940km/L. 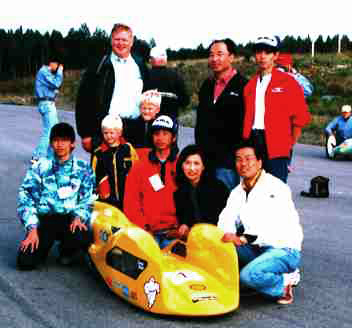 We went to NOKIA circuit from Helsinki by Bongo with our new machine.We arrived at 10AM and were very anxious about if torque shock at engine running was still not fixed.But we did everything to improve this problem. So I told myself that only I do was to trust to Providence.We moved our machine to the scrutinizing place.Our machine was new full monocoqued body and made up for adapting strict European regulations. Our car passed through a safety check but fuel line was not allowed because of the softness of 2.5mm diameter tube that was allowed in Belgium Eco marathon last year. It seemed that the scrutinizer was too much nervous about fuel line. 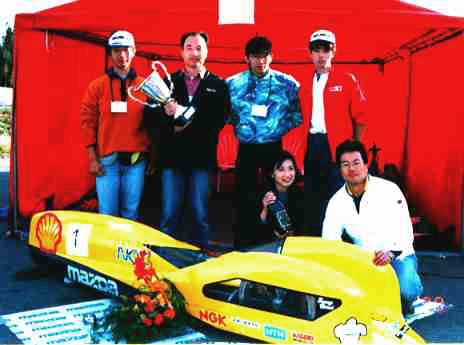 The reason was that there was some faithlessness points in the fuel line of the record in 1996 and they checked to remove such faithlessness points.We were impressed with their these efforts and trusted in them very much . We got more rigid tube from friendly Remmi-Team and passed through all. We moved our machine to the course and started testing run. After starting the car ,torque shock occurred soon. We amazed too much and instruct our driver don't use higher engine revolution and don't break freewheel that we have no spare one. As torque shock occurrence became many times at 13 laps,we stopped testing run. We measured fuel consumption at this half way and record was 2169km／L worse than testing in Japan. After moving to our pit,All member looked for the root factor of this problem. At last we discovered dog-clutch has about 1degree taper by wrong machining and when torque loaded,it had a possibility to release one. The teeth parts of dog-clutch was decomposed and shaved off taper face by the small grinder offering from frendly French OPTIMA team. Remaining time of testing course was shorter,we hurried up to fix it and did it at about 5PM. We started the engine and run the car .We found that there were no torque shock and gave cheers among all menbers. In the relatively strong adverse wind,the car run whole distance of 18laps. We measured fuel consumption and record was 2395km／L. We wanted to take more time to test running for enrichment driver's experience in NOKIA circuit. But circuit was closed and we go to dinner & sauna offered by the Shell and officials. We enjoyed traditional finish dinner and sauna to the full,especially swimming in the cold lake after sauna was so great. In the competition, competitor could attempt 3times. We made a plan that favorite was 2nd attempt at 12:30 because highest temperature reduced air and rolling resistance. 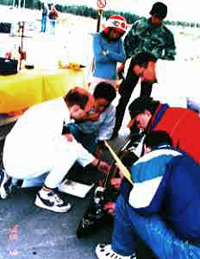 At the 1st attempt,we start the car at the condition of 5bars air pressure in the tire for safety spec. and temperature was not so good at15degree. 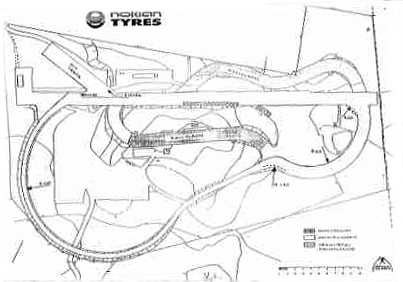 Our driver cauldn't smooth handling as about 1hour experience on this track. We didn't instruct collect handling to driver now because It was important for her to get familiar this course. After this attempt,we would make reflection of it to the driver for favorite 2nd attempt. After 2nd lap,adverse wind blew the cars and reduced the speed. Our car somehow run whole 18 laps and was measured fuel consumption and record was 2608km／L. People around there shouted for joy. guessed that favorite spec. got more higher record and our heart swelled. Member around the each corner instructed driver collect line to steer. 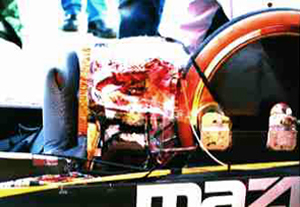 And we found that engine temperature was down in the race because our 30cc engine run only 6second per lap. Then restarting engine was difficult from the half way. So we attached adiabatic material on the engine completely and furthermore wrapped double with vinyl chloride plate and shut the radiant heat. After raising tire pressure at 7kg/cm2, suddenly rear tire exploded. The tire went out of rim because baby powder used at assembling tire made easy to move. As the rim had transformed too, bent the rim to origin by pliers. 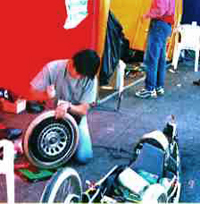 We glued tire on rim not to go out perfectly and put air into tire at 7kg/cm2 again. We warmed up the engine much then let the car start at 13:00. Temperature was raised up 22degree but the strong wind hit the car and car speed was down. So we thought this attempt was not good. Suddenly car stopped because of puncture. The tube was holed by small edges made by plier bent the rim. We hurried up to let the car start before temperature down. We wrapped edge of rim with vinyl tape and assemble tire. After warming up the engine,we started the last attempt quickly at 14:43. It was good for us temperature was still 22degree but strong wind blowing. When we wished the wind blow weaker ,the wind almost stopped at beginning of our 2nd lap.And furthermore driving at each corner was so smooth we guessed that we would get better record if as it was. We looked intently our car lapping, but stopped at about 6laps. This time was puncture by a bit on the road. We moved our car to the pit and measured 2.3cc of fuel consumption. Considering much fuel consumption at starting and didn't engine on at last corner of last lap. Our prediction of fuel consumption was 6cc. We regretted so much but our challenge ended. 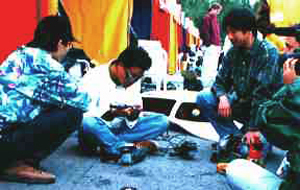 Ryouji kagawa in charge of engine, I, Yoshio Fujita of chief mechanic. 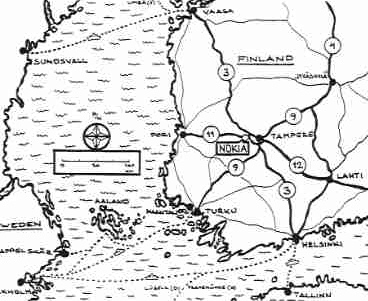 260 New Finnish Record ! World Record ! ; BC 1.